Review posted June 22, 2016. Disney Hyperion, 2016. 48 pages. This book arrived at the library just in time to use it for booktalking in the schools. It’s a perfect book for booktalking. You just read the beginning and stop at the suspenseful part. Those kids are going to come after it, I know they will! Ian is a rule-follower. His sister Jenny is not. 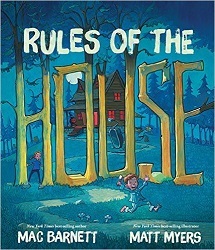 So when their vacation cottage in the woods has a list of Rules of the House on the wall, Ian is delighted. 1. Remove muddy shoes before you enter the house. 2. Don’t leave a ring around the bathtub drain. 3. Replace any firewood you burn. 4. Never – ever – open the red door. Right from the start, Jenny does not follow the rules. There is a showdown. Jenny flung the door open. And that is where I shut the book and say that you need to come to the library and check it out. What I will say to my readers is that Jenny’s punishment is appropriately scary and Ian ends up having to (*gasp*) break a rule in order to save his sister. The whole result is funny and slightly scary and wonderfully overdramatic and a marvelous yarn. I asked a class of second graders how many like rules, and about half raised their hands. This is also good food for discussion about when following rules goes too far, and when it’s a good way to keep you safe.